and the majestic White Pine is still where I gravitate. This is my "yoga studio" at Lake Ozonia. That big 'ole trunk is a White Pine. My arms need to be at least 1 foot longer, each, to completely encircle this tree for a hug. Yes, I most certainly hug it! 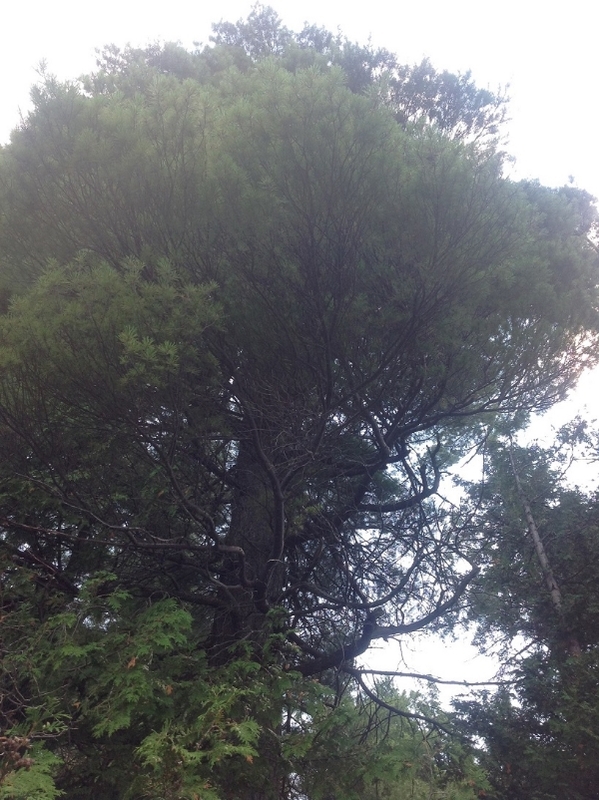 Read on to discover why you should hug White Pines as well. This is a picture, me looking up from the triangle pose, into my White Pine, Yoga Studio canopy! Life force energy is the energy that flows through all living things. It is what the Chinese call Chi or Qi energy, Hindu cultures call this Prana, and western healers call it vital energy. Whatever name you give it, Life force energy flows through our chakras, nadis, and meridians. If life force energy and chakras are a new concept to you, what fun to immerse yourself into this learning! The two pictures below show you the pattern of spiraling energy about the chakras and where the chakras lie in the human body. So what, pray tell, does this have to do with Great White Pines? Were you asking this question: "Where ARE you going with this, Paula?" Native Americans valued the Great White Pine for many healing purposes. The needles were chewed, eaten, and made into tea to prevent scurvy in the winter. The sap was used to heal many skin issues, hemorrhoids, insect bites, poison ivy, to draw out splinters and styes, boils and pimples...colds, congestion, and the flu! My favorite way to interact with the Great White Pine is to revel in its majesty, strength, and beauty. The Natives realized the White Pine was, and still is, a power house of life force energy. Sitting, with one's spine in alignment with the trunk of a White Pine, is the Native American's method of infusing one's body with life force energy. All cultures speak of ways we can increase (and decrease) our life force energy. I have to say, this "Great White Pine tree sitting" method of increasing life force energy is by far my favorite. My beagle and I had this technique mastered 35 years ago! Hugging one of my favorite White Pines on the Red Sandstone Trail! Here I am, getting a "life force" infusion from the same favored white pine! I often sit here, my spine hugging this white pine, contemplating life. Your homework: Get outside and introduce yourself to a Great White Pine. Marvel at its amazing size and strength. Wrap your arms about it in a big hug. Too big a trunk? Find a friend, hold hands, and hug the pine together! Sit underneath her and lean your spine along her trunk. Stay put for at least five minutes, close your eyes, and revel in the energy you are sharing with the Mighty White Pine!